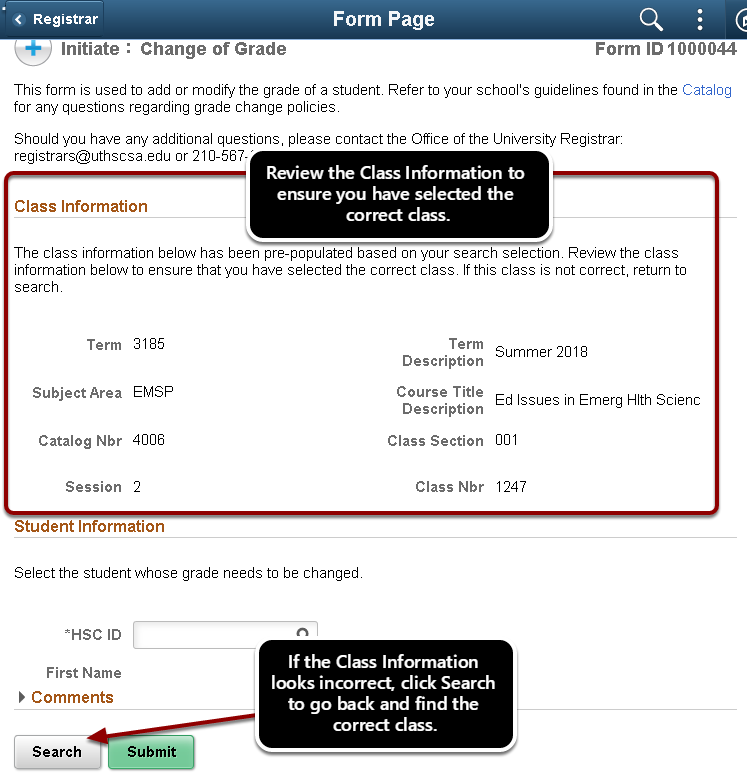 The Grade Change form is used by staff and faculty to modify the grade of a student in the official student record. Reference How to Log into My Student Center for instructions on logging in. Use the magnifying glass icon next to the 'Term' field to assist you in finding the correct term. You can only search for classes that you have permission to modify grades. This permission is set on the Schedule of Classes. If you cannot find the class you need, contact your department or dean office to ensure that you have been given access to grade or approve grades for the specific class. 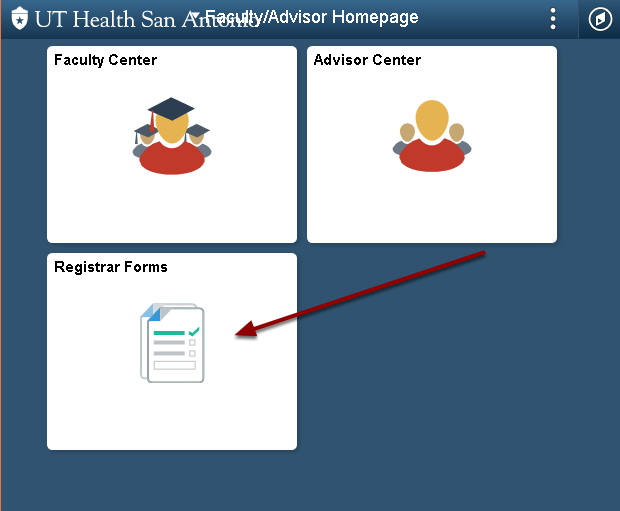 Contact registrars@uthscsa.edu for additional assistance. If your search criteria brings up only one row, then clicking search will automatically take you into the form. This is to ensure that you have selected the correct class. You cannot select a student unless they are enrolled in the class. If you do not see the student you are looking for, first verify that you have selected the correct class. Then ensure that the student is actually enrolled in the class. Contact registrars@uthscsa.edu for assistance. You can sort students by last name by clicking the Description heading. 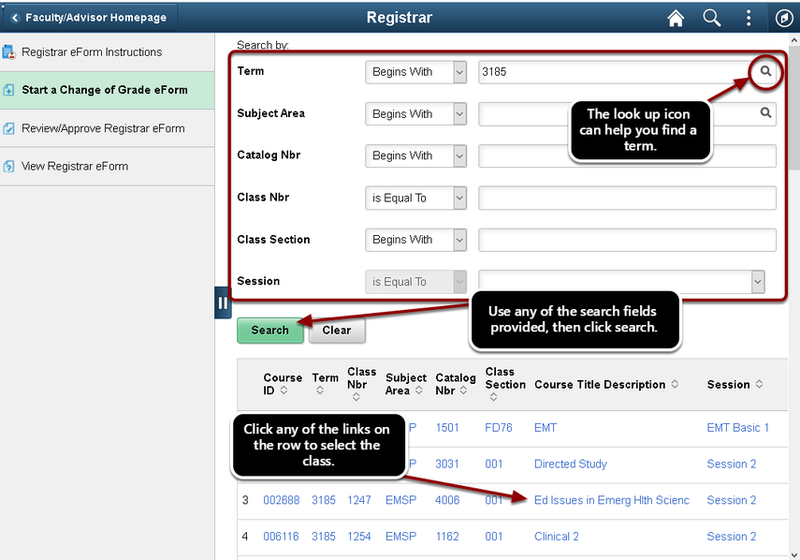 If you want to search by an individual student, expand the Search Criteria section and search by Value (HSC ID) or Description (Last Name,First Name). Use %First Name to search by first name, or click 'Show Operators' to search by 'contains' instead of 'begins with'. The previous grade is listed. Select the look up icon to select a value for the new grade. Only available grades for this class are listed under the New Grade look up icon. If you do not find the grade you wish to assign, contact registrars@uthscsa.edu. Comments placed on this form are subject to review by the student per FERPA and are maintained in the student's record. Select the Comments heading to optionally leave a comment. How do I find out who submitted this form? I click the link in the email but it says "Search returned no results." There is an eForm in workflow that is wrong! How do I delete/withdraw this eForm? There are multiple approvers at this workflow step. How does this work? Change of Grade: Why can't I find the class I need? 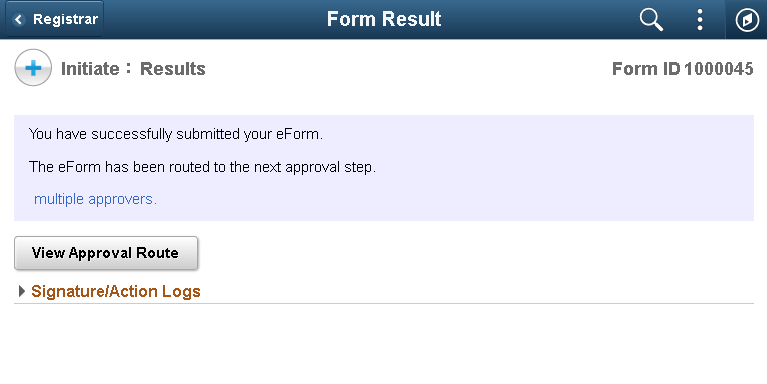 Change of Grade: I just submitted a Change of Grade eForm, but the Course Approvers are wrong.